Phoblographer*: What's in a name? A magazine by any other would have as low a circulation. 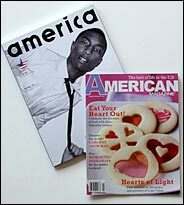 America has a cover price of $8 and will be sold or provided to a rarefied, highly selective audience. American, with a cover price of of $3.95, inhabits the aisles of chain stores, including every Wal-Mart, the nation's biggest company, which has managed to brand itself as a small-town booster. Reality will always chew away at the edges of the Hallmark card ethos that drives American Magazine. And America's unified theory, that hip-hop brings everyone together, has proved to be mortally wrong on occasion. But like most magazines they are aspirational. America depicts a hip, unattainable place, and American is marketing an ineffable state of being. With all that's going on in the world, it's a worthwhile exercise to consider the denotations and connotations of both titles.